Three of the world's eight species of bears are found in the United States--the Black Bear, the Brown or Grizzly Bear and the Polar Bear. In each of these three species, you can detect differences between the males and females if you have an awareness of their particular characteristics and observe the bears carefully. Look at the face and head of the bear. If the ears seem to be large in proportion to the head, and the face seems narrow instead of round, it is likely a female. A male usually has a wider and rounder head, making its ears appear smaller in proportion to its head. Observe the bear when it urinates. If the urine appears to come from underneath the bear's belly, it is most likely a male. If the bear squats and/or the urine appears to come from its back end, it's probably a female. Assess the body of the bear. If the body is large and round, it probably is a male. 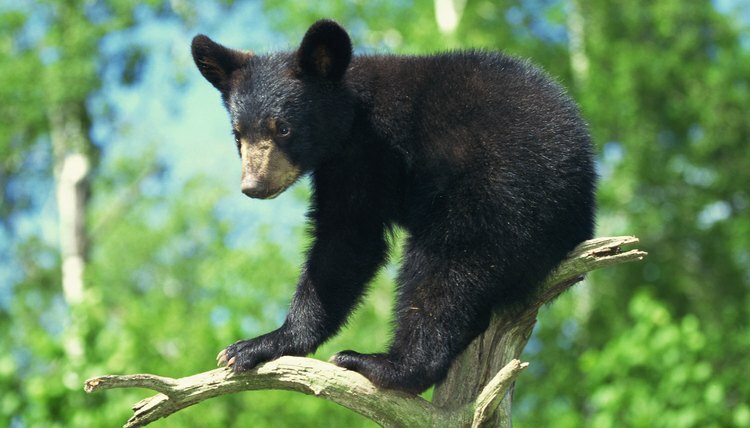 Black bear females are usually smaller and leaner than males. Take note of how the bear urinates. If the urine streams out of the back of the bear, it's a female. If it comes from underneath the torso, it's a male. Look for the sexual organ of the male. Information from Grizzly Bear.org states that it is usually visible on male grizzly bears, even though it is small in proportion to its body. Observe whether or not the Grizzly bear has cubs with it. If it does, then it's a female. Grizzly cubs stay with their mother for two to four years before living independently. Take note of how the Polar Bear urinates. If the urine originates from the back of the bear, it's a female. If it comes from the bear's belly area, it's a male. Assess the Polar bear's size. Male polar bears grow two to three times larger than their female counterparts. Males typically weigh between 772-1,433 pounds, and are 8.2 to 9.8 feet long, while non-pregnant females weigh in at 331-551 pounds and are 6.6 to 8.2 feet in length, according to information on SeaWorld.org. Look for Polar bear cubs accompanying or nearby the adult bear. Polar bear cubs stay with their mother for approximately 2 1/2 years after birth. If the cubs are with an adult, it is a female.